The World Championships are now over for this time. We spent the last two days running the spectator races and enjoying the Hungarian cuisine. Today was the Long Final, next to the Slovakian border in the north. The terrain was karst with big depressions and rocky ground, but mostly very open forests. The Swiss dominated with wins both in the men's and women's by Daniel Hubmann and Simone Niggli. We are now getting ready for the banquet and party tonight and packing our bags to come home for the Canadian Championships in Manitoba next weekend. Thanks for following our racing in Hungary! 38 nations started the men's relay at 11 am this morning close to the village of Bankut. Patrick Goeres opened for Canada, but struggled a bit on the first leg. After a small mistake on the first control he lost the train of the leading pack and then had to fight the rest of the way without the help of the speed of the fastest teams. Patrick changed over to Mike Smith in 27th position, 9:25 behind Russia. Mike had the best run of the day on the Canadian team and picked up to 24th, passing Team USA out in the forest. Jon Torrance ran the last leg, but was not able to hold off the Americans and dropped down to 29th. In the fight for the medals, there was a very dramatic finish. France, Sweden and Norway had pulled away in the lead when the Swede Martin Johansson got a stick of wood in the leg, causing a deep cut and a lot of bleeding. The French Thierry Gueorgiou and the Norwegian Anders Nordberg stopped to help Johansson and were soon joined by the Czech Michal Smola. Nordberg ran for help while Gueorgiou and Smola stayed with the Swede to stop the bleeding. Meanwhile, the chasing teams passed through the forest without noticing what had happened and the Swiss ran in as gold medalists, unaware of the drama. Johansson was eventually taken to hospital in stable condition and will recover. The rescue team of Smola, Gueorgiou and Norberg then decided to jog the rest of the course together to complete the race and was greeted at the finish as heroes with applause. The women's relay was also very exciting with changes in the lead as mistakes were made in the tricky and difficult terrain. In the end it turned out to be an all Scandinavian affair with Norway taking the gold before Sweden and Finland. The final event of the week is only hours away! Since no Canadians made the Long Final this year, the relay is our grand finale of WOC. We are aiming to improve upon our #23 bib! And of course, beat the Americans. There should be good online coverage with TV, audio and radio controls. The 3rd leg runners will carry GPS for live tracking online as well. Patrick improved his result from the Sprint Final last year in Czech Republic, breaking into the top 40, finishing in 38th position. He felt a little bit tired after the qualifier in the morning, but the race was basically clean apart from a few hesitations and map stops. Behind the amazing winning time of the Russian Andrey Khramov the field was very close. "Only" 50 seconds faster would have moved Patrick all the way up to the top 20. Silver and bronze went to Switzerland again for Fabian Hertner and Daniel Hubmann. For the women it was a great day for Sweden with gold and silver to Helena Jansson and Linnea Gustafsson respectively. Simone Niggle got the bronze for Switzerland. 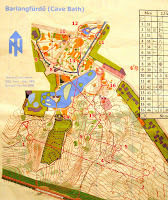 The courses went through the beech forest again, but also into the Miskolc Zoo for some very tricky controls. The arena production was impressive with two big screens and several cameras on the course. Tomorrow is the relay, where the Canadian men will run with Patrick Goeres, Mike Smith and Jon Torrance. Patrick Goeres made it into the Sprint Final with a hard run without much time lost on mistakes. 11th position with 13 seconds to spare! The terrain was not quite as tricky as the model map indicated, but still required intense navigation. Controls were placed very close and there was an unusually large number of runners disqualified for punching the wrong control. Patrick's exact start time in the final is 4:36 pm local time in Hungary (e.g 7:36 am in Vancouver, 11:36 am in Halifax). Make sure to follow the on-line coverage! Will Critchley also had very fast running speed. 2/3 into the course he had a clean run, but then lost time on a mistake as the course entered into an area of buildings and fences. Jon Torrance had good speed as well, but too many mistakes pushed him down the result list. Louise Oram and Carol Ross were both about 45 seconds on the outside after good runs technically. Just need a little bit more speed! Congrats to Patrick who appears to have qualified in 11th position in the 3rd men's heat. Unfortunately Will and Jon are outside of the top 15. The women's race is currently underway! 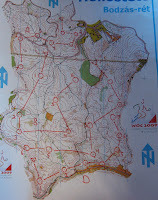 This year's sprint is a forest sprint that will favor navigation more than in the last several WOCs. The terrain is still mostly very open beech forest with steep hills, re-entrants and ditches. There are also sections of thicker green areas. At a scale of 1:4000 the features in the woods are coming towards you extremely fast and it will be important with a cool head, to take an extra moment with the map and to always run with a plan. The Final for the Men is at 4:20 pm and the Final for the Women is at 5:30 pm local time in Hungary. These times should work better for those in Canada to follow the races on-line. Strangely, the opening ceremony of this year's World Championships took place today, after the first two races of the event had already been put in the books. The teams all gathered in the park at the WOC "village", i.e. the university campus in Miskolc. After a short flag parade there were some speeches and short entertainment, a local Hungarian dance and a chime concert! Earlier in the day, the team went out on the model map for the Relay (and Middle Final). The terrain in this area is more rough. Larger areas of the forest have limited visibility and there is more undergrowth and dead trees on the ground. Those of us not running the Sprint on Thursday will go out to the Middle Final and watch the races on site. There will be TV coverage and big screen at the arena. Can the great French Middle distance maestro, Thierry Gueorgiou, win his 6th gold medal in the Middle distance at WOC? For 5 EUR you can follow the TV coverage from the Middle Final from your computer back home in Canada! The Middle Final is bundled together with the Sprint, so the access code you purchase can be used for that race as well. The women's race starts at 9:30 am local time, followed later by the men's race. The men's race should be wrapped up at around 1:15 pm local time. The second day of races at WOC was in the same place as the first. Back to the village of Bükkszentkereszt! Similar terrain obviously, but west of the arena this time. Both women's and men's courses started with a long route choice leg across a large side hill. After that they looped back towards the arena and a spectator control and then back out for a second loop. Here is the map showing the three men's heats. Team Canada had another day where things were not quite going the right way. Patrick Goeres had the running speed of the fastest world stars, but lost a lot of time in the final attack of the first control. Despite staying on pace with the best for the remaining 7.5 km of the course, he was still 1:46 on the outside. Nick Duca had good speed, but made a few too many mistakes and the rest of the team were fairly happy with their races technically, but did not have enough power in the hilly terrain and fiercely competitive field. We will now take two days to recharge the body and mind for the sprint on Thursday. Stay tuned! 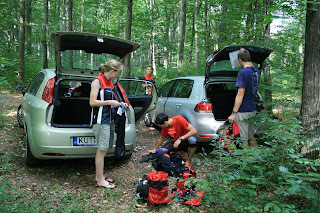 The Middle Qualifier took place this morning in the forest near the small village of Bükkszentkereszt. The area of the race was fairly small, basically a single hill with some rock features, pits and depressions. Mostly very open forest, but also one larger area of denser woods. As expected there was plenty of side hill navigation. Check out this map showing the 3 courses of the women's heats. First out was Will Critchley in his first ever orienteering race in Europe! He had a solid race without any bigger mistakes and was happy at the finish. Carol Ross was next out in her WOC debut. She felt good for most of the course, but had one mistake and several smaller bobbles and was not entirely satisfied with the run. Nick Duca had the strongest run of the day, with only some smaller "hooks", leaving him just over 2 minutes outside of the last qualifying time. Louise Oram had a great run except for one major problem, stopping too early on the long leg in the green and losing too much time there. Mike Smith lost a couple of minutes on the first two controls and was not able to get that time back on the rest of the course and also finished outside of the qualifying time. The team is now resting, getting ready for revenge in tomorrow's Long Qualifier! Excitement is growing as the first race of WOC takes place tomorrow! Today was the model event for the Middle with real flags at the controls for the first time. This felt pretty nice after several days of searching for tiny sticks on the ground. The forest was full of athletes of all nations running around in different directions, trying to get a good feel for the terrain and the map. The general feeling in our team was that the map was still slightly iffy with regard to the vegetation and rocks, even though it was better than the training maps. 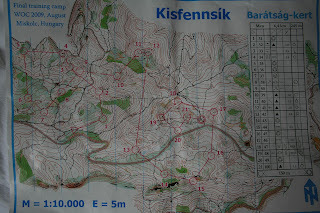 The race tomorrow will most likely involve lots of side hill orienteering, which is always a bit tricky. The forests are mostly open with great visibility, so it will be important to keep your head up and spot features and the flag from far away. This will allow you to run more aggressively and cut time. On the start line tomorrow for Canada will be Louise Oram, Carol Ross, Will Critchley, Nick Duca and Mike Smith. This morning was another training relevant for the middle and long terrains. Coach Magnus finally joined the team last night after some adventures on the East European railroads, so he shadowed most runners through several controls. Extra focus, compass direction and heads up from the attack point and in to the control was the theme of the day. It's easy to get lazy on the last 100 meters into the flag! 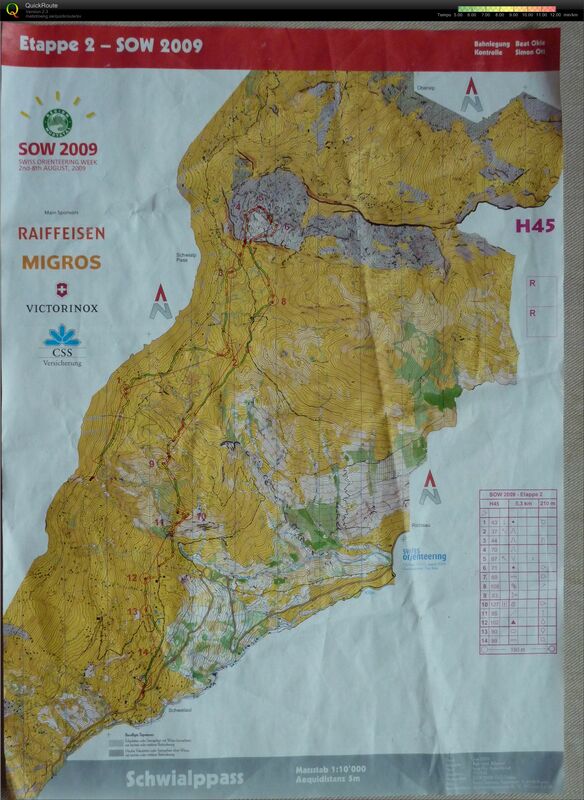 The training maps are a bit out of date with regard to the vegetation, and also the boulders and rocks are badly "overmapped", so it is important not the get too caught up in the details of the mapping and focus more on the general feeling of the forest and orienteering system. The actual WOC competition maps will obviously be updated and rock will be mapped to proper IOF standards. This afternoon is strictly rest and tomorrow will be on the "proper" model maps. Here are a couple of shots from a visit to the Millenium tower after our training yesterday. For most of the week, we're running in the Bukk (beech) mountains and Bukk National Park. The terrains are mostly very open and runnable hills that are big and steep. The limestone composition of the mountains means that there are areas of stony ground near the tops of hills and ridges that influence route choice. The mapped rock features (boulders and cliffs) tend to be smallish and so most of the navigation is by the major contours. We've had another good day of training here. This morning we headed west on some hair-raising, switchbacking mountain roads to a training map for the middle and the relay. We're really enjoying the fast and open forests, especially those of us from Vancouver. Check out the women's map. Here's a photo of Carol, Jon and Dan at the look of near the map. Soon we'll have news for you about more sprint training and the Cave Baths. We're also looking forward to seeing Magnus, who's (actually) arriving tonight. The toilet with its self-cleaning seat was also an eye opener. Unfortunately no cameras were brought for visual reference. The runners have arrived and we are happily settled into the Uni-Hotel in Miscolc. We are picking up Coach Magnus tonight to complete the team! Our accommodations are great, complete with well-stocked fridges, clothing dryers and good Mike's awesome espresso maker. This morning's training was a good warmup with O-tervals in some fast, open forest. In the afternoon, we did a sprint course. Check out the maps! Team Canada arrive the Hungarian town of Miskolc tomorrow Tuesday, Aug 11. We will spend 6 days preparing and getting ready for the World Orienteering Championships that start on Aug 16. The team goal is to have Canadian representation in all finals and for the men's relay team to improve on last years position (i.e. better than 24th). Sunday Aug 16: Middle Qualifier - Louise Oram, Carol Ross, Will Critchley, Nick Duca, Mike Smith. Monday Aug 17: Long Qualifier - Louise Oram, Carol Ross, Nick Duca, Patrick Goeres, Jon Torrance. 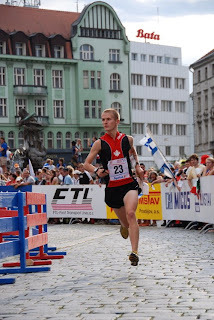 One of the members of Team Canada made his final preparations for the World Orienteering Championships in a bit of an unusual setting. Last year's WOC Sprint finalist Patrick Goeres, spent the last ten days in Whitehorse, Yukon. During that time he completed 10 map sessions and one orienteering race. Whitehorse has several maps with negative kame-kettle topography and side slopes not unlike what athletes will experience in Hungary. You can check out some of the training maps on Brent's blog. 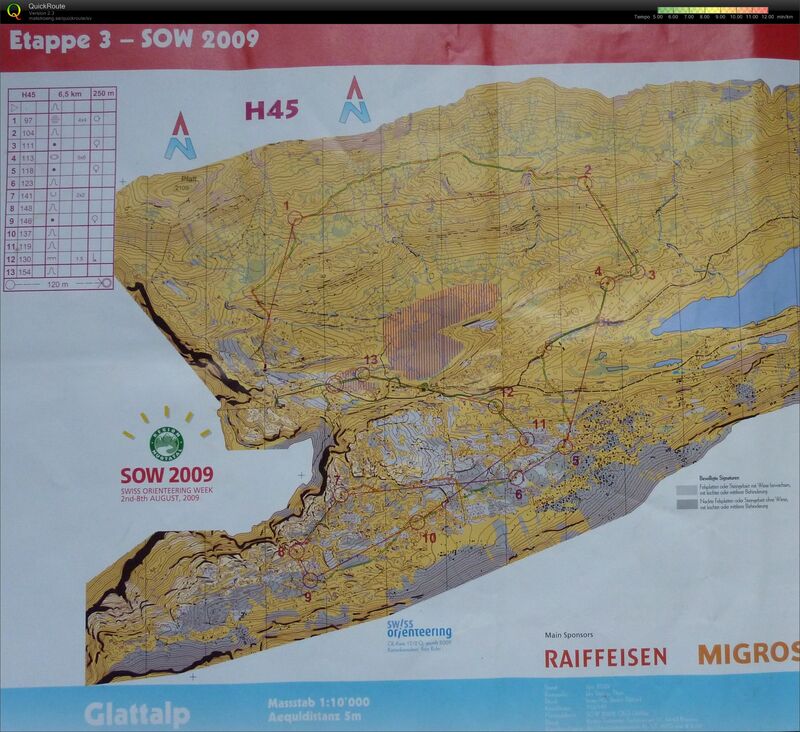 You can also see the map from the race. The Yukon is not normally known for its hot weather but record temperatures over 30 degrees during this time meant perfect conditions for acclimatizing to the heat that awaits the athletes in Hungary. So there were several hard hill sessions in the middle of the day. As added preparation for the heat, Patrick's last session before leaving was an hour tempo run followed by a 3x3 min interval session on the treadmill wearing a long-sleeve polypro top, two t-shirts and a toque. He got a few strange looks from the regular gym users. A couple of Team Canada members, Carol Ross and Emily Kemp, are in Switzerland at the moment taking part in Swiss O Week. Carol is there getting some quality time on maps before the World Championships in Hungary start, while Emily has been in Europe since her outstanding Junior Worlds performances (top 30 in the middle and the long). After three days of competition, the highlights have been a very good 19th out of 34 (and top North American) for Carol in the Day 1 Women's Elite (DE in the results list) sprint. Many of the very best Swiss runners were taking part. To give you an idea of the level of competition, last year's WOC silver medalist in the middle distance was 3rd. Day 3 included an outstanding performance by Emily, who is running up in the Women's Elite category. She finished 3rd and was actually leading at the 10th control. The two girls ahead of her are both from the Swiss National Team. 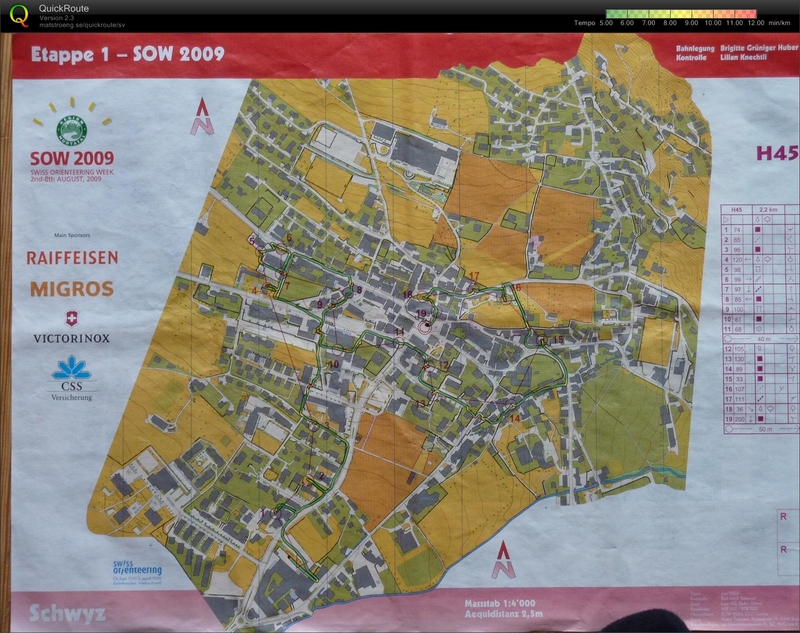 Maps (NOT the women's course) from Stage 1, Stage 2 and Stage 3.